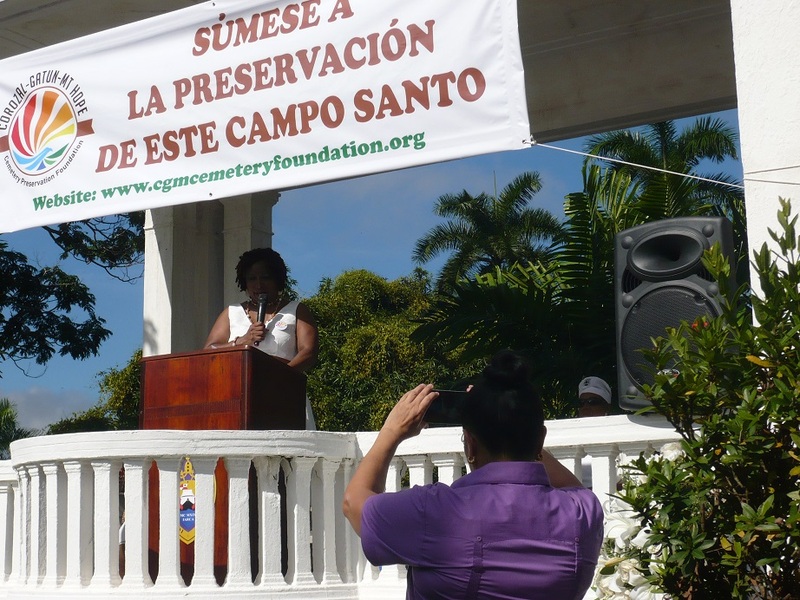 Opening the ceremony at Corozal Cemetery Gazebo was Carmela Gobern. Frances Williams Yearwood tells us all about CGM Cemetery Preservation Foundation. Tee shirts and caps for sale as part of CGM’s fundraising program. As the Christmas celebration commemorating the birth of our Lord and Savior, Jesus Christ, approaches, we take a moment to give thanks to the Lord for answered prayer. 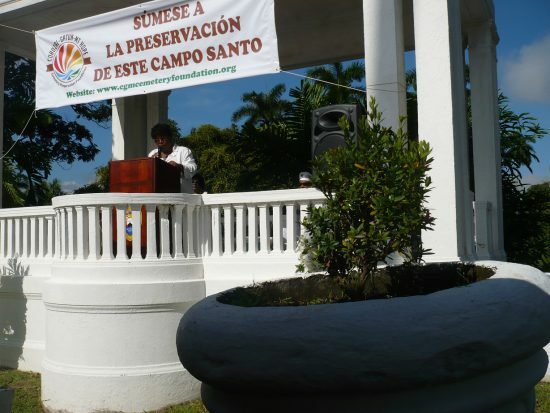 Thanks to the organizational efforts of Mrs. Carmela Gobern and the members of SAMAAP’s board of Directors and to Mrs. Frances Williams Yearwood, founder of the Corozal, Gatun, Mt. Hope Cemeteries Preservation Foundation, on Saturday, November 2, 2016 we sat as invited guests to the initial memorial Ceremony at Corozal Cemetery and witnessed the power of unity among brethren. We were treated to a beautiful spiritual message by Rev. 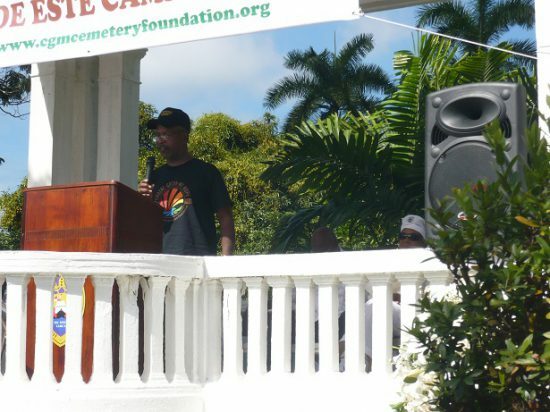 Nelson Edwards, and several anecdotal narratives recalling the great achievements of our West Indian ancestors who, for the first twenty years after the inauguration of this cemetery, were the majority of occupants of this burial ground. We also enjoyed a wonderful musical review by Emely Myles and a splendid sampling of the poetry of Mr. Louis Emanuel, our dear friend who troubled himself to transport us to Corozal Cemetery. This ceremony was the culmination of a three day cleanup marathon spearheaded by Frances Williams Yearwood and her brigade of volunteers partnering with some personnel from the INAC which left Corozal Cemetery in near pristine condition. It was a beautiful as well as significant ceremony underscoring the resiliency and perseverance of the West Indian Panamanian to achieve something important when we are truly led to. We invite you, nay, we exhort you to join this movement to continue to preserve these symbolic cemeteries of the presence, participation and sheer faith of our black West Indian ancestors who sacrificed life, limb and time with their own families to carry out the building, completion and maintenance of the Panama Railroad and the Panama Canal. 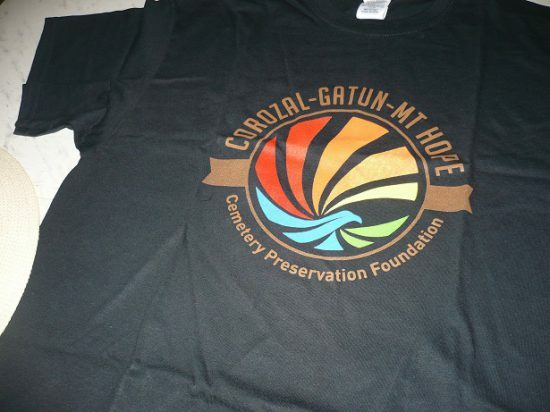 Please visit the CGM Cemetery Foundation web site as well as SAMAAP’s web site to donate funds, volunteer your time and send in messages of support and encouragement so that we may keep our dream of preserving in glorious and dignified condition our sacred burial grounds a reality. This entry was posted in Cemetery history, Mount Hope Cemetery, Silver People and tagged CGM Cemetery Preservation Foundation, Corozal Cemetery, Frances Williams Yearwood, Gatun Cemetery, Louis Emanuel, Mt. Hope Cemetery. Bookmark the permalink. Dear Friends, thanks for your tireless work keeping our history alive. Congratulations again on all that you’ve accomplished. May your Christmas and New Year be blessed with abundance.